Sometimes you just really need pizza. And by sometimes, I mean all the time. Especially when it’s as easy and delicious as this Spinach & Mushroom Naan Pizza! Almost every Friday night, Cody and I go out for pizza. Whether it’s meeting friends at a pizza place or staying in and ordering Dominos (YES, such a splurge fave of mine! ), it’s known that Friday nights are pizza night for the McMichaels. You can also look in our freezer at just about any given moment and find at least one frozen pizza in there. If anyone was to ask me what my all time favorite food is, it would take me approximately 0.1 seconds to shout out “Pizza!”. It’s just SO GOOD. And I’m a little bit obsessed with it. My pizza obsession is actually quite the problem when it comes to healthy eating. Learning to balance splurging and eating healthy is another story (I wrote an entire book about it…check it out HERE! ), but I’ve embraced pizza night as my splurge meal night and absolutely love it! However, this Spinach & Mushroom Naan Pizza is easy, quick, and healthy! It’s so perfect for a quick and easy vegetarian weeknight dinner! I actually made this Spinach & Mushroom Naan Pizza in a frenzy after being gone all weekend. We traveled all day on Sunday and by the time we got home, we were starving! We stopped by Whole Foods, which is a rare but glorious occasion, and loaded up on our weekly groceries that included this delicious Naan bread, vegan cheese (you can use regular cheese, but I used vegan because I’m attempting to be dairy free this month), spinach, and mushrooms. When we finally arrived at our house, I threw these Naan bread pizzas together in about 20 minutes total! Cody ate 2, I ate 1, and it was the best day ever. Off topic, we also managed to FINALLY take down our Christmas tree that day (yep…it’s almost March….). It truly was a glorious day, indeed! 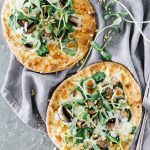 This Spinach & Mushroom Naan Pizza recipe is a great way to eat healthy but feel like you’re splurging! If you love this recipe, be sure to check out these other easy pizza recipes: 10-Minute Margherita Pita Bread Pizzas, Roasted Radish, Arugula, & Havarti Pita Bread Pizzas, and Spinach Pesto & Goat Cheese Individual Pizzas! Top each naan bread with olive oil, spinach, cheese, and mushrooms. Garnish if desired. Place on a baking sheet and bake 15-20 minutes (or until cheese is melted). Serve and enjoy! This naan pizza was elegant, simple, and DELICIOUS! We needed a quick recipe for our mid-week dinner and decided on this one. What a great decision! We made it as is and I drizzled some homemade balsamic glaze on top of each pizza. My mouth is still watering thinking about it!!! Such perfection. Christine, thanks for sharing your wonderful recipes with us! Hi, thank you for sharing this recipe, it looks delicious! Would you allow me to use this on our website? We are certified organic microgreen growers in the Pacific Northwest and are currently compiling a list of ideas for what to do with microgreens to give our CSA customers some options to try. Of course, we would credit you with the recipe and include a link to your website if you agree. Thank you! I absolutely love this naan pizza. Looks very light and so delicious. Who said you can’t have pizza while eating healthy right?! 😉 Can’t wait to try this out. Thank you, Natalie! Right?! AGREED! Haha enjoy! Love it!! It’s seriously the BEST. Me too, Molly! Glad we can relate on this, haha! You just took down your Christmas tree? Lol! You’re so funny! Oh the busy life of a food blogger! Love the idea of making pizza on Naan bread and the spinach and mushroom topping is my favorite! Haha YEP. And really only because we had family coming into town. Otherwise it would most likely STILL be there! Ah, life, yes. Enjoy the recipe, friend! I agree with you naan make great pizza base. I have tried it. Adding spinach and mushroom make it more versatile. Naan pizza is all the rage now, isn’t it? I love naan so much, I have a hard time thinking of using it for anything other than serving with homemade Indian food, but I do bet that naan pizza is delicious, especially with spinach and mushrooms! Yes, it’s so great!! Haha, I know. The toppings really transform it! Enjoy the recipe, Julie!